The upcoming Game of Thrones themed version of Settlers of Catan! 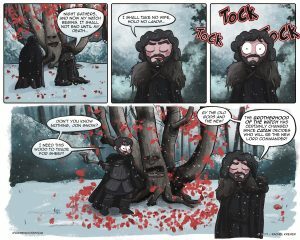 In this game, the Night’s Watch is trying to determine who will be the next Lord Commander. The game focusses on improving the Gift, the lands behind the wall. Players will have to try to strengthen their hold on the north by building roads, settlements and keeps. But there is a looming threat from beyond the wall… wildlings might invade your lands.